Since I picked back up the Weight Watchers program last month, I am finding myself looking for Weight Watchers SmartPoints snacks options as well as meals. I am managing great and losing weight, plus never feeling like I am unsatisfied. Huge bonus for me is that I am dropping weight slowly but surely. Mostly, I feel good again. That said, some things just leave me needing fuel between meals. So, I am sharing what I have decided are my top choices in snacks. I admit that since my weight is so high, I get a lot more points than some. That said, I still watch closely, and mostly I am focusing on eating more fresh vegetables, and limiting my sweets to the fresh fruit the bulk of the time. This is my favorite section since these are free to eat. While you could eat as many as you wanted, I try to limit my fruit intake to around 1 cup per day. Vegetables, I like to have a decent serving with lunch and dinner, then instead of having seconds on a starch or entree, add another portion of vegetables if possible. 1-2 cups of vegetables a day is a must, but often more. I could go on and on about how much I love cheese, but I realize that it just isn’t the best choice for me when it comes to snacking because I tend to go overboard. If I want to have cheese as a snack, I measure it in advance so I don’t give in to a large portion or grabbing a chunk without measuring. SmartPoints are listed beside each with the portion amount. Salty snacks aren’t a huge issue for me unless I am craving cheese dip – then it’s a problem. However, I have found some alternatives that work great for me. Like adding an ounce of pepper jack cheese with some pretzels. That’s a great choice that satisfies me and kills the craving. That said, I am listing a few of my favorite snacks that are easy to have on hand, and include SmartPoints calculated for convenience. Sweet is an issue. I usually combat this with using fresh fruit, but when I am really struggling, I will grab one of these snacks as an alternative that includes the SmartPoints calculations. I recommend going with fruit and avoiding sugars as much as possible, though, as they tend to make you crave even more than before. Also, my friend Sadie from Slap Dash Mom gathered up some great Weight Watchers Frozen Desserts to share the other day. This list includes SmartPoints on the bulk of items, so if my suggestions don’t satisfy your craving, jump over and check out what she included. The idea behind the new Weight Watchers Smart Points system is to calculate points for healthier choices. So, lean meats, vegetables, and fruits have fewer points while things like baked cookies, snack items, and those high-fat choices that are processed have more points. In a way, it’s a new method to hold you accountable for making better choices in your diet, while still not depriving yourself. 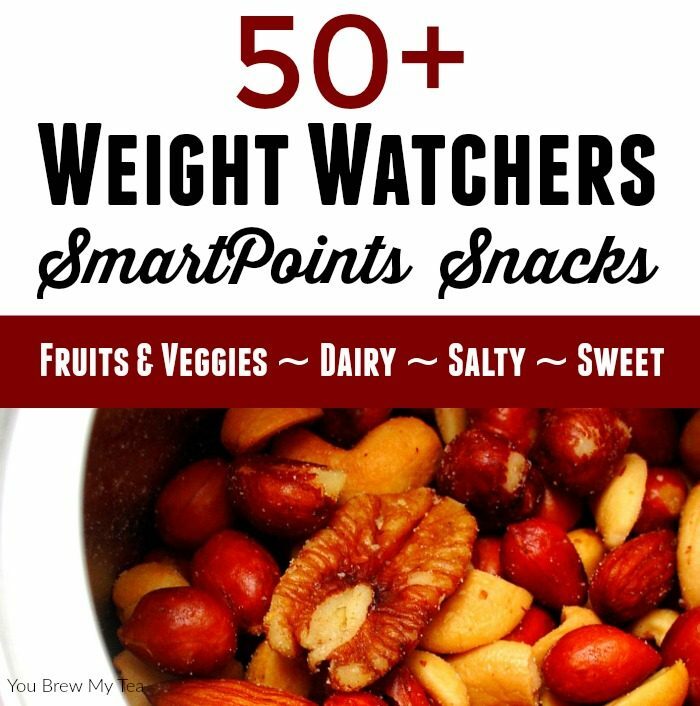 I hope this list of great Weight Watchers SmartPoints snacks helps you stay on track like it has for me. It comes in handy when I am meal planning, as well as when we are on the road. I always know what I can grab and have that fits easily into my remaining points for the day! This is a great list of snacks! I don’t do weight watchers but these are still great healthy snack ideas. Thanks for sharing with us at Merry Monday this week! I am riding the fence right now about re-joining WW. Thanks so much for joining us at Delicious Dishes! 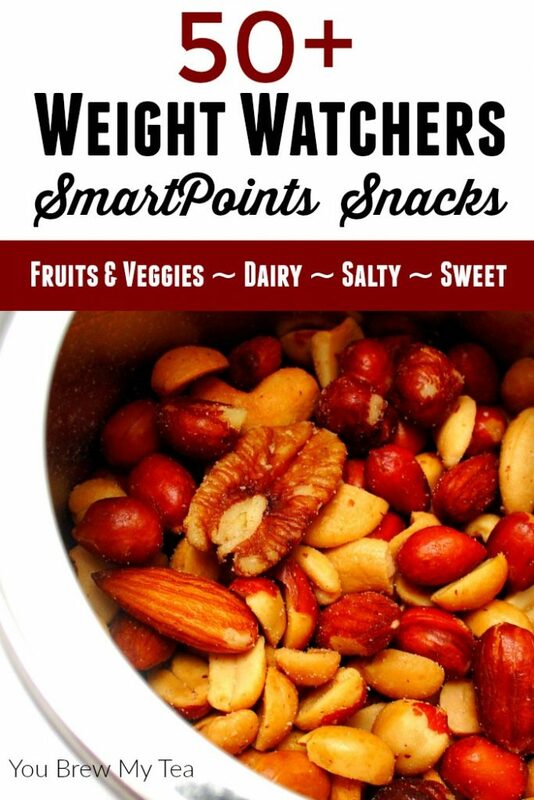 We love your Weight Watchers Smartpoints Snack Ideas and hope you’ll join us again this week! I think you might be wrong on the points for Turkey bacon, you say 5 pieces is l smart point, I used my calculator for the butterball turkey bacon , and it said l point per piece. Katie you posted the recipe for the spinach dip could you please tell me points. Thank you. I’m enjoying the many recipes you post. Thank you. Hi! Thanks for putting this list together! I thought eggs are zero points? ?